Mega Sale! Free Shipping Included! 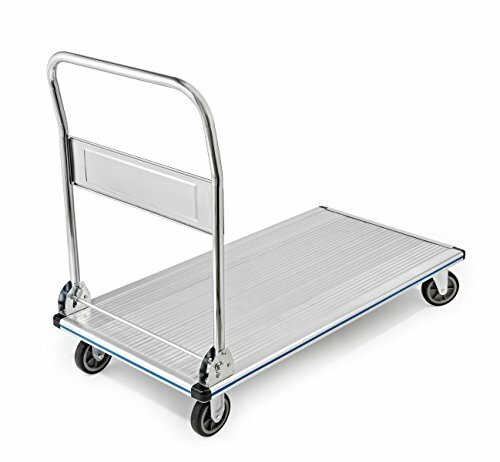 Save 26% on the AdirOffice Folding Aluminum Platform Truck - Flatbed Cart - Single Handle - 5'' Non-Marking Polyurethane Casters - 600 lbs Capacity - 48'' x 24'' by AdirOffice at In The National Interest. MPN: 690-00. Hurry! Limited time offer. Offer valid only while supplies last. Ideal in industrial and commercial settings, the AdirOffice Folding Aluminum Platform Truck can be used for transporting heavy loads up to a 600-lb. Ideal in industrial and commercial settings, the AdirOffice Folding Aluminum Platform Truck can be used for transporting heavy loads up to a 600-lb. capacity. As such, this handy tool is perfect for any application that requires heavy lifting time and time again. The platform is expertly constructed of durable aluminum to provide long-term strength and use throughout the years. For increased durability, the deck is corrosion-resistant, permitting use in any type of weather or environment without the material breaking down. Even though the AdirPro is extremely durable, it only weighs a mere 28 lb for easy transport. Combined with its lightweight, the cart maneuvers easily and quietly on two swivel and two, rigid 5" rubber casters. Integral vinyl deck bumpers on each corner will protect your cargo from damage, as well as doorways and walls from getting scratched or scuffed. The folding platform truck will protect workers from injuries while maximizing productivity and improving efficiency in any environment. Offering a great solution in warehouses, receiving docks, manufacturing plants and distribution facilities, the AdirPro will surely save time and money for many years to come. COMPACT, LIGHTWEIGHT DESIGN. Durable yet lightweight, the AdirPro only weighs 28 lb for ease of use. It measures 48" in length with a 24" wide platform, and features an ergonomically designed handle which can be folded down for compact storage. EASY TO TRANSPORT. Quiet, rolling wheels -- two swivel and two, rigid 5" rubber casters -- make it easy to maneuver the truck wherever you need to go. It's perfectly sized to navigate through narrow corridors and is outfitted with integral, vinyl deck bumpers to protect transported items, doorways and walls.